Home » Featured » News & Updates » Spring Break 2019 Will be Bigger and Better! Spring Break 2019 Will be Bigger and Better! Spring Break plans for Panama City Beach 2019 have already begun and if 2018 was an indication that Spring Break is back in Panama City Beach, wait until you see what we have in store for 2019! Marketing and promotions teams are already meeting up to discuss concert and event ideas, promotional incentives, and a variety of other improvements. 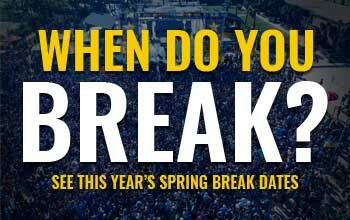 Spring Break is the largest student event of the year, with an average student base of 2 million traveling to various destinations and Panama City Beach plans to continue with its intent to make this the a major destination once again. So, what can we expect in 2019? More high profile live concerts, more nightly and daily events, bigger brands and giveaways, and more savings offered to students. For continuous updates and interactive discussion on what’s happening and what’s in the works for #PCB2019, keep checking back with us by visiting our website at www.pcbeachspringbreak.com frequently.